On this page, you will find all there is to know about the Software updates for Ultimate Chicken Horse on Nintendo Switch (originally released on September 25th 2018 in Europe, North America, and Japan)! 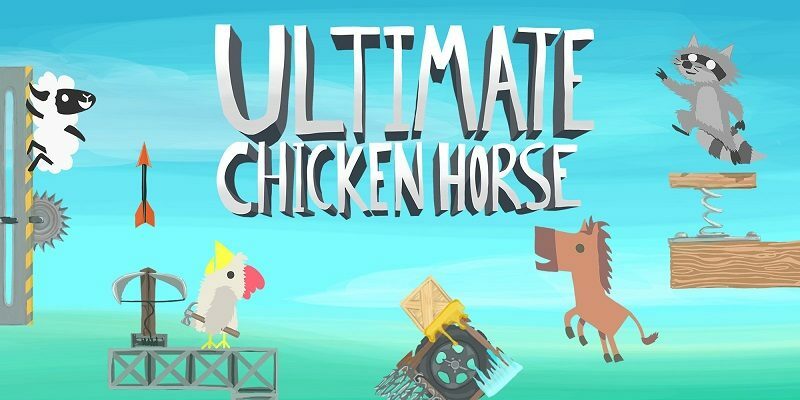 How to download updates for Ultimate Chicken Horse for the Nintendo Switch? To check that you have the latest version installed, simply select the game on the Home Menu, and press – or + to go to the Options: the version number is displayed just below the game title. Improved the diagonal input on analogue controls sticks, so it better matches the result of holding up and sideways on keyboard. Jetpack dispenser will be infinite, instead of only 4 jetpacks per round. Fixed a bug that caused all of the blocks in the level collapsing into 1 spot, the game lagging, and sometimes crashing. Caused in online games by all clients leaving the game. Fixed jetpacking upwards into certain ceilings or blocks killing you. This is most notable in the underground area of Jungle Temple. Fixed Characters getting pushed up into blocks or ceilings have their colliders set to crouch, making them 1 block high, allowing them to sometimes fit in places they shouldn’t in certain complex modifier + level designs. Fixed certain combinations of Ghosts, and deaths that led to the UI not displaying correctly. Fixed Dead bodies being duplicating when retrying in challenge levels with the Ghosts modifier turned on, leading to levels filled with bodies and system slowdown. Fixed an issue where sometimes a player couldn’t pick up a jetpack from a jetpack dispenser. Prevent Dead Hop after holding B to retry in challenge levels. Fixed an issue with a certain special characters in save file names. Skins! You can now unlock alternate costumes for all 9 animals! New Items: Jetpack and Jetpack Dispenser. Improvement: Many blocks can now be both rotated AND flipped. Hold the Sprint button while pressing the flip/rotate buttons to use the other transformation. Flip the spinning saw! Rotate the hockey puck shooter! Prevent players from rejoining your lobby once they have been kicked. Fixed the alignment of some art on rooftops so that wall jumping matches with it better.